CHIPS, Christian International Peace Service, is ‘working for peace in areas of conflict and tension’. The Installation of a Coventry Cross of Nails for CHIPS took place on 9th September, 1999. Committee for Conflict Transformation Support: Members and associates of the Committee have run workshops, seminars, discussion groups or debates with organizations and individuals involved with peace, human rights, peace education, the well-being of refugees and displaced persons, the analysis and resolution of conflict, the care of those traumatized by violence, and those who are themselves involved in training in a variety of organizations. With Anglo Episcopalians (in the Diocese of Maine) and Indians working together, the Committee on Indian Relations seeks to heal some of the wounds left by 500 years of cultural assault upon Indian people in North America. Corrymeela Community of Northern Ireland: Corrymeela is people of all ages and Christian traditions, who, individually and together are committed to the healing of Social, Religious and Political divisions that exist in Northern Ireland and throughout the World. Coventry Peace House: Coventry Peace House is a peace centre for Coventry and a member of Radical Routes, a group of forty Co-operatives around England, all trying to make a better world, live simply and support each other. Episcopal Peace Fellowship: The Episcopal Peace Fellowship is a body within the church whose mission is to aid and encourage all Episcopalians to strive for justice and peace among all people and to bear nonviolent witness to Christ’s call to peace. Fellowship of Reconciliation The largest, oldest interfaith peace and justice organization in the United States. Uses education, training, coalition building and nonviolent action. The Greensboro Truth and Community Reconciliation Project is a broad community-based initiative that seeks to help Greensboro [North Carolina] create a brighter future by earnestly engaging its past. It is the first attempt of its kind in the United States to initiate a process whereby a community can resolve painful and divisive aspects of its history in a spirit of truth-seeking, forgiveness, and transformation. Reconciliation Ministries, located in Jacksonville, Florida, provides practical guides to community unity. The aim of the Soul of Europe is to make Europe a more decent, just and humane part of the world. It is the organization that sponsored the Banja Luka reconciliation consultation at Coventry in September, 2001. The United States Institute of Peace is an independent, nonpartisan federal institution created and funded by the United States Congress to strengthen the nation’s capacity to promote the peaceful resolution of international conflict. Witness for Peace: A politically independent, grassroots organization, committed to nonviolence and led by faith and conscience. The World Conference on Religion and Peace is the largest international coalition of representatives from the world’s great religions who are dedicated to achieving peace. Respecting cultural differences while celebrating our common humanity, WCRP is active on every continent and in some of the most troubled places on earth, creating multi-religious partnerships that mobilize the moral and social resources of religious people to address their shared problems. Following the bombing of the mediaeval Cathedral in 1940, Provost Howard had the words ‘Father Forgive’ inscribed on the wall behind the Altar of the ruined building. These words are used as the response in the Coventry Litany of Reconciliation, which is prayed at Coventry Cathedral every weekday at noon. Action Reconciliation Service for Peace (ARSP) sends about 160 young German adults annually to the countries which were affected by WW II to work with the peoples who suffered through the Nazi regime. The volunteers work in a broad variety of peace, social-justice and service organizations. Christian Outreach Relief and Development (CORD):Serving children and refugees worldwide, the overall objective is to enable communities and individuals to have greater control over situations that affect their lives, to encourage self-reliance and to provide sustainable solutions to problems. The Flying Hospital not only treats thousands of patients wherever it lands but also enables the training of local medical staff. Campaign for Forgiveness Research: A scientific study that is currently exploring the unique role of forgiveness in healing individuals, families, communities and nations. For four decades, the Center for Strategic and International Studies (CSIS) has been dedicated to providing world leaders with strategic insights on—and policy solutions to—current and emerging global issues. The Mission of The Centre for the Study of Forgiveness and Reconciliation at Coventry University is to be a centre of research, teaching and related activities which will contribute to the deeper understanding and promotion of processes of reconciliation and forgiveness throughout the world. Tolerance.org A Web project of the Southern Poverty Law Center, Tolerance.org encourages people from all walks of life to “fight hate and promote tolerance.” Check out the 101 Tools for Tolerance: Simple ideas for promoting equity and diversity. WagingPeace.org An International Education and Advocacy Group On Issues of International Peace and Security. 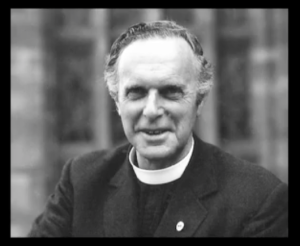 This video was posted by Jane M L Williams on her Facebook page – it is a rare interview with Provost Williams that was filmed by ABC TV in 1964 on the eve of launching the appeal for the Coventry Cathedral Dresden Project. We invite you to listen by clicking on the photograph below.